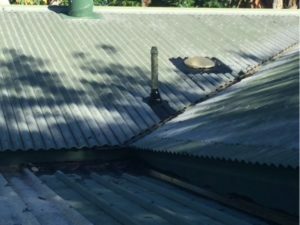 We recently received a request from a client to attend a property in North Queensland to assess and quote on the damage caused to the roof when a tree crashed down during a storm. Upon arrival, the insured advised that water had come through the ceiling in the kitchen and the adjacent patio. The insured stated that the day after the storm he accessed the roof and painted a black waterproof membrane on the valley, roof sheets, skylight flashing, vent pipe and dektite as well as the patio roof to prevent further water ingress. He also stated that he removed some leaf matter from the roof. Our Estimator completed an initial inspection of the kitchen ceiling and could see the surface of the plasterboard sheet had a stipple finish and the sheet was sagging and expansion had cracked the cornice. An inspection of the ceiling cavity revealed the valley directly above the damaged ceiling sheet was the cause of the water ingress. 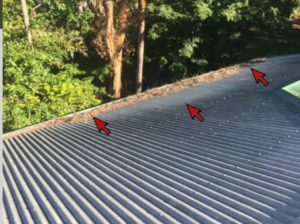 An inspection of the roof confirmed the presence of the black waterproof membrane, which made commenting on the pre-existing condition of the roof difficult. 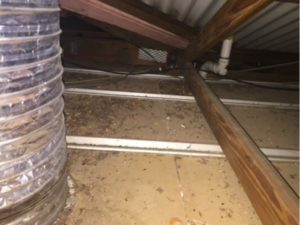 No storm damage was identified, nor was any owner maintenance or building defect that would have contributed to the water ingress. In the professional opinion of our Estimator the valley would have been backed up with debris which would have restricted the flow of water down the valley iron. 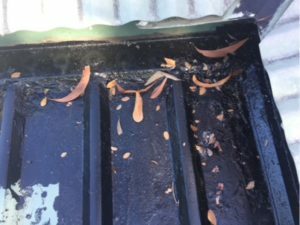 This conclusion was supported by observations of other valleys and gutters having a heavy buildup of leaf matter still present and the insured stating he had cleaned the debris from this valley gutter. Our Estimator was curious as the original causation reported by the insurer was damage from a falling tree. A single small dent was located on the patio roof that the insured said he believed was caused by a tree branch falling onto the roof. Inspection of the lower patio roof had waterproofing also painted on the roof sheets and internal corner below the valley. All flashings appeared to be in good condition, although a complete visual inspection was hindered by the surface being covered in the black waterproof membrane. The dent on the patio roof was observed to be directly in line with the leaking valley and was between roof battens. Its location is consistent with the natural pathway to inspect the valley and our Estimator believed the dent was more consistent with foot traffic over the roof. It was noted that the dent did not contribute to the water ingress and in his professional opinion the dent was not caused by a falling tree branch. We inducted the home owner into our site specific safety system which included our Workplace Health and Safety Management Plan and Project Safety Environmental Analysis being applied to the site. Our trades are inducted into our Safety System annually and the PSEA and SWMS for each site completed and updated as the repair progresses. On Friday 24/2/17 our licenced electrician disconnected a light that was in the middle of the plasterboard sheet to be replaced and isolated the wire in the ceiling using a junction box ready for the ceiling sheet replacement to commence on Monday 27/2/17. On Monday 27/2/17 our plasterer removed a 1350 x 3600 ceiling sheet and was prepping the ceiling battens for the install of the new sheet. In doing so the plasterer touched the fifth batten in from the external wall which gave him an electric shock and threw him off his plasterer’s trestle (approximately 800mm off ground) landing on his shoulder. The plasterer immediately contacted our local Building Supervisor advising he had received an electric shock and proceeded to hospital via ambulance. Our Supervisor actioned our Safety Incident Reporting Plan and immediately notified our Safety Officer and State Construction Manager via phone, advising them of what had occurred. Our Supervisor advised he was heading to site to inspect the work area and make the site safe. En route our Supervisor contacted our electrician who attended site within 20 minutes of the incident occurring. 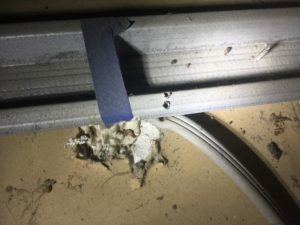 Upon inspection, it was identified that a subsequent light wire, located approximately 6m away from our area of operation, had been screwed through directly into the metal ceiling batten. It appears this had been done during the original construction of the home and the ceiling batten had been live since that time. Upon further investigation by our electrician it was found that the screw had only pierced the active wire when it was screwed through into the batten, therefore the metal ceiling batten was live however as it was not able to be earthed, meaning this would not be picked up by any tests done during the completion of the house by the original electrician or builder. Our electrician identified that if the screw was just 1mm over, thereby touching the earth and the active, this would have resulted in the power cutting straight away during original testing and the problem would have been found and rectified. The meter box was inspected which found that the power point circuit has a residual current device (RCD) which is designed to break the electric circuit within 300 milliseconds to prevent serious harm from an ongoing electric shock. However the lighting circuit did not have an RCD installed. At the time of the construction of the home, approximately 25 years ago, it was legal to complete the install in this manner. Even if the lighting circuit had been equipped with an RCD, this still would not have highlighted the problem at the completion of the original build. What the installation of an RCD on the lighting circuit would have done, was at the time of someone touching the batten, it would delivered a shock but the RCD would have tripped and prevented someone from clenching onto the object they were holding. The matter was reported to Workplace Health and Safety as required and as a result we met on site with a WHS Inspector and Electrical Safety Office Inspector to review the incident. Our safety system was fully inspected and found to be compliant with legislative requirements. The main lesson from this repair is vigilance. Previous work practices and standards can and will have an impact on the repairs we complete today and well into the future. In this example, there was nothing to indicate that a lighting cable had been screwed through and the batten was live. Previous testing had failed to identify the risk present and the home owner’s had resided in the property for years with no problems or issues occurring. 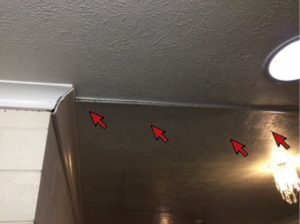 As Estimator/Supervisors, becoming hyper vigilant to the location of cables in ceilings; and identifying if they run under battens and not over them, is just one indicator that a hazard exists in that environment. 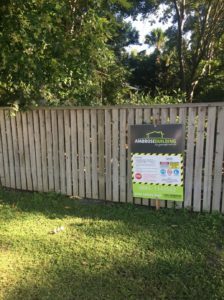 The investment we at Ambrose Building have put into our safety system and procedures is purely designed for the safety of our trades, staff, occupants of the home and their visitors, now and into the future. The plasterer reported dislocating his shoulder and has taken time off work. 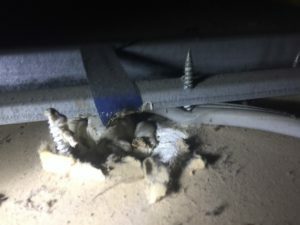 This case study highlights the importance of using a QBCC Licenced Supervisor, even on the smaller value jobs because you never know when a safety incident might strike. For any questions about our site specific safety system please contact our Safety Officer Mike Hessell.